The absolute most important part of this recipe is to be sure your kale is SUPER Dry. 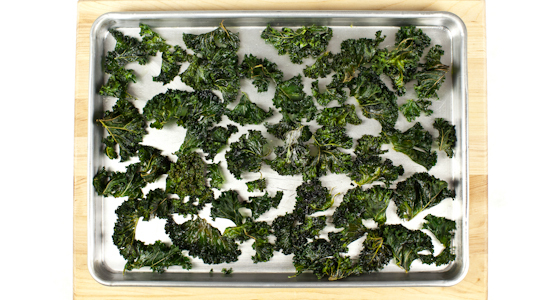 If it is even a little bit wet, or you use even a little too much olive oil, you will end up with mushy, steamed kale instead of crispy kale chips. Probably not the worst thing in the world, but certainly a disappointment when you are awaiting crispy chips. Tear the leafy parts from the ribs/stems and place on a baking sheet. Bake in 250° oven for about 20 – 30 minutes. Toss kale every 10 minutes so it crisps evenly. Remove from oven when it’s all toasty and crisp. Enjoy right away – or store in an airtight container.